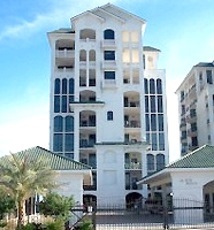 La Belle Maison condo for sale in Perdido Key FL. One of the most exclusive beachfront, low-density developments with only 14 luxury residences; coded building entrance, rent-restricted to one year minimum rentals; gulf side pool and hot tub; boardwalk to the beach; large sun deck with pavers, sauna, steam room, exercise facility, covered parking with exterior/climate-controlled storage. Solid poured in place re-enforced concrete construction with wind rated windows and doors. This resort home features 10'+/- ceilings, large great room with dining area, large kitchen with island, wet bar, and large living room space, large private deck, floor-to-ceiling windows and doors throughout, granite counter-tops and stainless steel appliances in the kitchen, custom cabinetry, incredible views of the Gulf of Mexico, travertine flooring - much more, come see this incredible luxury property.